The first features Dominique Goblet, a Belgian graphic novelist, who will speak in London about her oeuvre, including the recent translation of her bande dessinée Faire semblant, c’est mentir, first published in 2007, into English by cartoonist Sophie Yanow, author of War of Streets and Houses. Born in 1967 and based in Brussels, Goblet’s work can be defined as experimental, varied in style, poetic and often biographical. Well known for her wide range of artistic mediums and eclectic style of visual storytelling, she was an early contributor to the comics publisher Freon’s anthology Frigorevue. 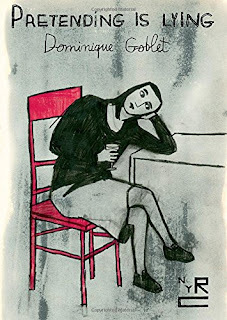 An artist, comics author, and professor of comics and illustration, Goblet is also certified as an electrician, plumber, and welder who was involved from the start in the creation of the experimental comics publisher Fremok, she published several books with them: Portraits craches (in 1997), Souvenir d’une journee parfaite (2002), and Les hommes-loups (2010).